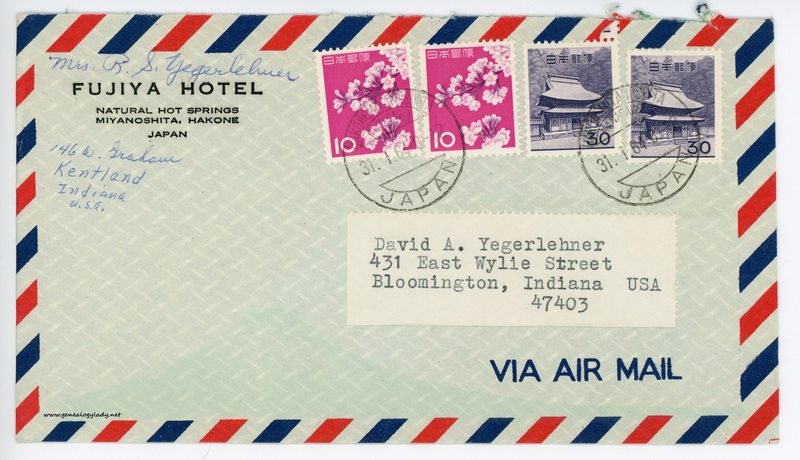 I mailed you a letter from Atami, but received yours when we arrived at Fujiya Hotel. Now please be careful with your habits at the new address. I know you are good friends but a good way to spoil a good friendship is to become too friendly, so be careful not to presume on your reputation. You wouldn’t have cared for the drive we just had – we came thru 10 Province Pass. We came thru rain, snow, fog & maybe a little sleet. We were to see Mt. Fuji en route (weather permitting – it didn’t permit). There are some people traveling around but this isn’t their busy season. On the train we saw a lot of green things but in spring and summer it must be beautiful. We will be here two days, then go to Hong Kong. It isn’t exactly warm here but when we get to Indonesia I know we will be in warm zone again. 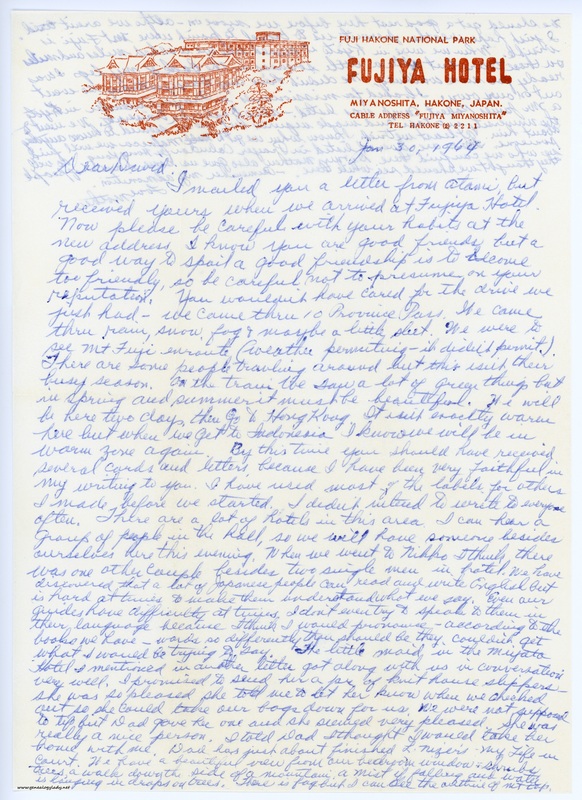 By this time you should have received several cards and letters because I have been very faithful in my writing to you. I have used most of the labels for others I made before we started. I didn’t intend to write to everyone often. There are a lot of hotels in this area. I can hear a group of people in the hall, so we will have someone besides ourselves here this evening. When we went to Nikko I think there was one other couple besides two single men in hotel. We have discovered that a lot of Japanese people can read and write English but is hard at time to make them understand what we say. Even our guides have difficulty at times. I don’t even try to speak to them in their language because I think I would pronounce – according to the books we have – words so differently than should be, they couldn’t get what I would be trying to say. The little maid in the Miyato Hotel I mentioned in another letter got along with us in conversation very well. I promised to send her a pr. of knit house slippers. She was so pleased she told me to let her know when we checked out so she could take our bags down for us. We were not supposed to tip but Dad gave her one and she seemed very pleased. She was really a nice person. I told Dad I thought I would take her home with me. Dad has just about finished L. Nizer’s My Life in Court. We have a beautiful view from our bedroom window, shrubs, trees, a walk down the side of a mountain, a mist if falling and water is hanging in drops on trees. There is fog but I can see the outline of mt. top. [page 2] We should get a good rest here before we move on – although we aren’t tired. I just hope weather permits us to travel to point where Mt. Fuji is visible. When we were in Kyoto it seemed like we walked miles and miles on those tours but after a little soreness in the back of my legs I was ready for more walking. We didn’t have any tours yesterday so went out on our won. I looked for missionaries in Prayer Calendar in Kyoto. A Mr. James Robert Camp was listed – also Doshisha University. We went to the University in a taxi and made inquiries but no one seemed to know anything about him. At least we tried. I know when we get to Malacca we will find someone. There are several listed in Prayer Calendar for Hong Kong, so will see who we can find there. Dr. & Mrs. Mathews also gave us some names of people they thought we should see while there. – Remember my admonition. 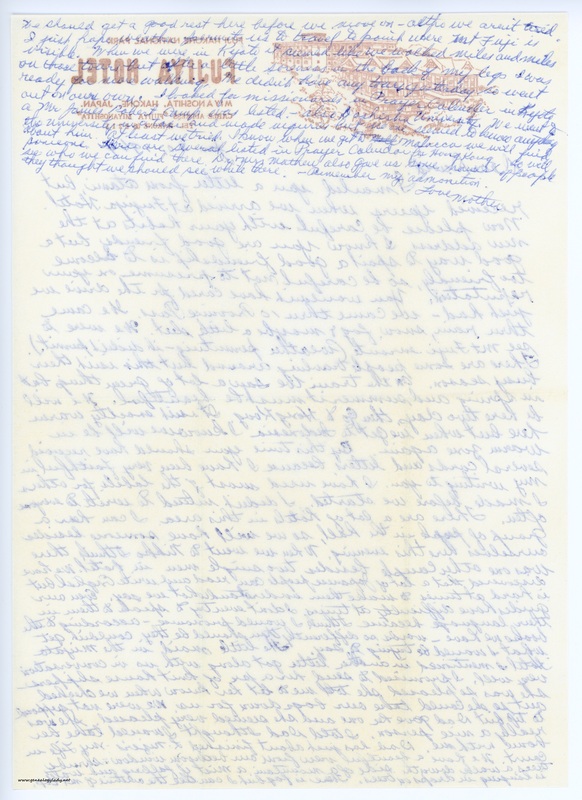 This entry was posted in Genealogy, Yegerlehner and tagged 1960s, Alta (Bittles) Mathews, David A. Yegerlehner, Dr. Wilbur C. Mathews, genealogy, Gladys R. (Foster) Yegerlehner, Indiana, Indiana University at Bloomington, Kentland, Louis Nizer, My Life in Court, Roscoe S. Yegerlehner on December 6, 2016 by Deborah Sweeney. “Now please be careful with your habits at the new address. I know you are good friends but a good way to spoil a good friendship is to become too friendly, so be careful not to presume on your reputation.” I had moved into the upstairs room at the home of Rev. & Mrs Levon King. “I told Dad I thought I would take her home with me.” Of course, later they did sponsor Japanese students.